These are all great pieces of advice when we feel like we are going to respond to something or someone in an unkind manner. 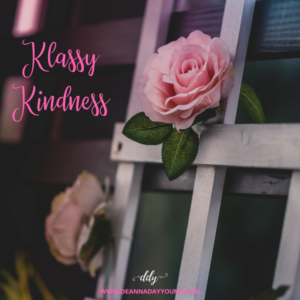 Candace Camerone Bure (Actress DJ Tanner from Full House) has written a new book, Kind is the New Classy. It is a must-read for our whole world, in my opinion. It’s just drawing our attention to how we all treat others. Whether it’s a selfish response during a conversation or a radical tirade on social media, we all tend to respond too quickly. It becomes a snowball effect after that. Pride steps in and we are too proud to apologize. Anger has already taken hold. Selfishness is at the root of all of it thinking that the whole world needs to hear our opinion or thoughts on a situation. We think we are wiser than everyone else. What if we take a challenge and try to be kind to everyone we come in contact with today – whether we agree with them or not? What if we choose to just listen and not respond? Or listen and respond in a soft tone. What if we treat everyone with respect and don’t think we were smarter? What if we look at every situation and act like Jesus would act? Don’t start pointing fingers and say “this is for someone I know.” No! We’re all guilty. It’s not for the liberals or the conservatives, the politicals or the non-politicals, the religious or non-religious. It’s for EVERYONE!! I’m not saying we have to be a doormat and allow people to run over us or not let our opinions be heard. All I’m saying is that maybe we just be kind for the day. See what we can do for others whether they treat us good or not. Just see if we can be the bigger person. See if we can be kind no matter what for the next 24 hours. I think it could have a ripple effect and maybe others would want to be kind as well. Then maybe we could try again tomorrow. That’s our challenge. Just be classy. Kind and classy. Starting today. Maybe continuing tomorrow. See how it goes. You In? This entry was posted in devotional, inspirational, motivational, spiritual on June 22, 2018 by Deanna Young.